There is no escaping that the Press are currently preoccupied with branding almost everything and anyone a 'national treasure' but fortunately The King's Singers firmly established themselves as such long before this recent craze began. Their fortieth anniversary year has turned out to be a timely reminder of just how good they are and left me wondering why we don't see more of them in concert and on television in this country. Fortunately, Signum have released this 2008 Prom both on DVD and CD and having started life as a BBC broadcast, the visual and audio quality is outstanding, and the Prom audience pleasingly attentive so none of the usual worries about buying a live performance really surface here. This programme offers a slice of the huge repertoire that The King's Singers cover which makes for an interesting concert peppered with some rather unusual juxtapositions. However, packaging aside the singers are the real event here and are simply outstanding all the way through this concert so much so that one can't help but draw parallels with The Hilliard Ensemble when they segue effortlessly from John McCabe's Scenes in America to Janequin's La Guerre. Indeed it is at these historical extremes that we the consort are at they're finest. They achieve a near-telepathic blend that can only come from the volume of work that they do with a relatively unchanging line-up, another similarity with the Hilliards. What other groups can do this? As with all 'sampler' programmes there will inevitably be afew numbers that don't appeal to everyone's taste and for me the Victorian partsongs, lovely though they are and beautifully sung too, happened to sound a little naff after the exquisite French Renaissance chansons. The DVD format is supreme when it comes to understanding the interpretive quality of these performances for the King's Singers are a charismatic bunch and their tenor (Paul Phoenix), in particular, has a deliciously mischievous look on his face when the music demands it. Moments of gesture and interaction within the consort are lost on the recording and may leave the listener wondering what the audience are laughing at but the studied concentration and sheer enjoyment of this ensemble really kept me glued to the screen – especially in 'Scenes in America' which was so good it was almost a master class in choral performance. 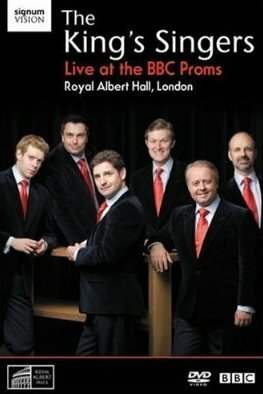 The DVD also has the advantage of containing extra tracks including a rather revealing audition with Gareth Malone when Philip Lawson comments on the group's lack of vibrato. I'm always wary of this vibrato stance – to say the King's Singers have none would be to imply they are nothing more than six oscilloscopes and they are so much more than that. I would prefer to limit myself to saying their sound is shimmering rather than oscillating; anything but dead. Just a few things felt slightly out of place on this DVD though. Firstly I could have lived without Suzy Klein's introduction which makes it feel too much like something I could have recorded off the television myself and lastly, the most wonderful part of the DVD extras, clips of the ensemble stretching back over 40 years, was less than two minutes long. What a shame. One of the great things about this concert is that it shows us the sort of standard that the category of 'national treasure' really ought to be made of. The King's Singers are a group whose roots stretch right back to the Twentieth Century choral and early music revival and even though their singers have changed over the years their continuing joy, commitment and charisma show how they managed to make such an impact on today's choral sound and I'm not sure that we, the listening public, always appreciate the full extent of their influence.